Top row (left to right): 1. unidentified, 2. Jimmy Nunes, 3. Kelly ?, 4. 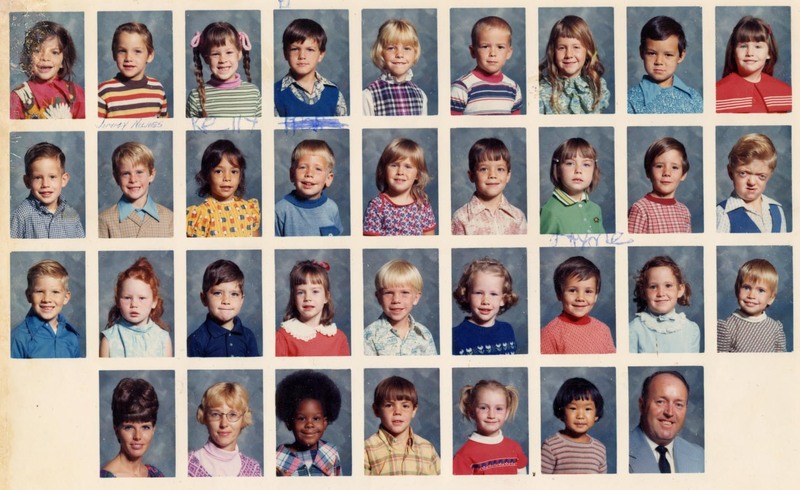 Bobby Gregson, 5. unidentified, 6. unidentified, 7. unidentified, 8. unidentified, 9. unidentified. Second row: 1. unidentified, 2. unidentified, 3. unidentified, 4. Joe Lee, 5. Linda Eddleman, 6. unidentified, 7. Jayme Street, 8. unidentified, 9. Stephen Bounds. Third row: 1. Larry?, 2. unidentified, 3. unidentified, 4. unidentified, 5. unidentified, 6. unidentified, 7. unidentified, 8. Maria Murphy?, 9. unidentified. Fourth row: 1. no picture, 2. unidentified, 3. unidentified, 4. unidentified, 5. unidentified, 6. unidentified, 7. unidentified, 8. unidentified, 9. no picture. Credits: From the collection of Jim Street. Thanks to Jayme Street, Lois Bounds, Doug Jones, and Tammye Kyle-Mitchell for identifying the kids in this picture.